The STRIKE can be used without the mini-seatplate and without the removable pocket. 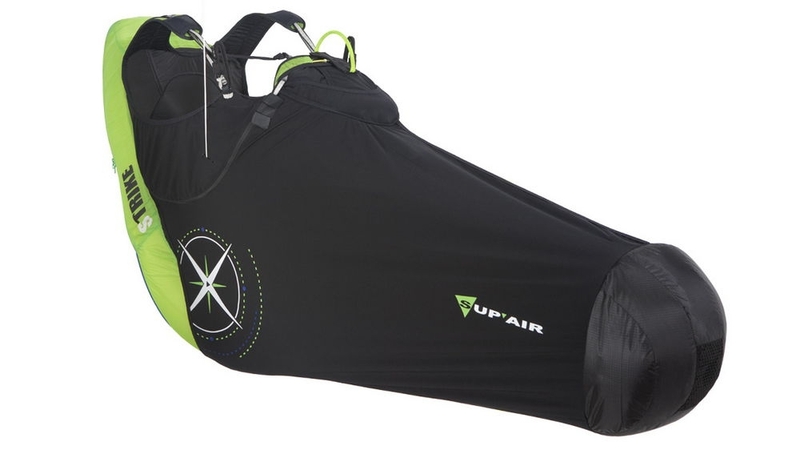 The easily removable BUMPAIR can be carried separately or may not be used at all in flight. We have made a few improvements on the STRIKE for the 2018 season to have it LTF certified by adding a compact and lightweight BUMPAIR back protector. The harness container was redesigned to accommodate a BUMPAIR 16 STK, 390g. The harness was certified LTF. Less than 40G during tests. The total weight of the LTF Certified STRIKE 2018 in size M is 2060gr (the previous version with the BUMP 14 STK was 2140gr and not LTF certified). the container pocket under the seat is now 9 liters (previously 5 liters). the rear storage pocket is now 26.5 liters (previously 12.5 liters). 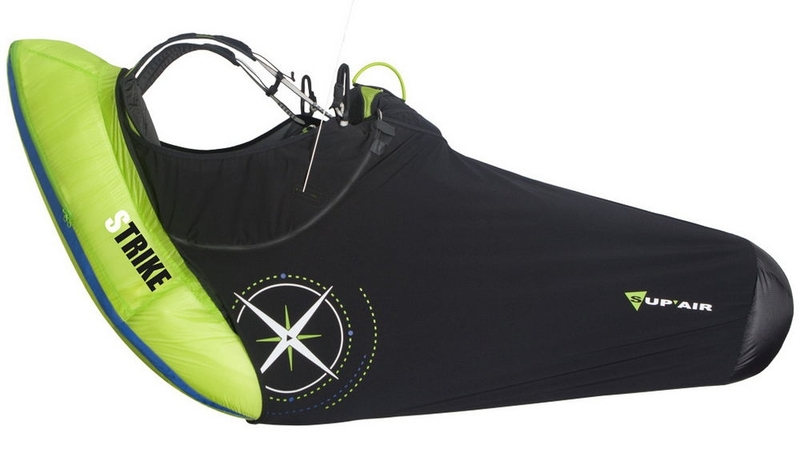 The removable "stuff pocket" is replaced by a radio (or camera pocket) integrated to the speedbag. The chest and leg strap fastening system prevent confusion between them. 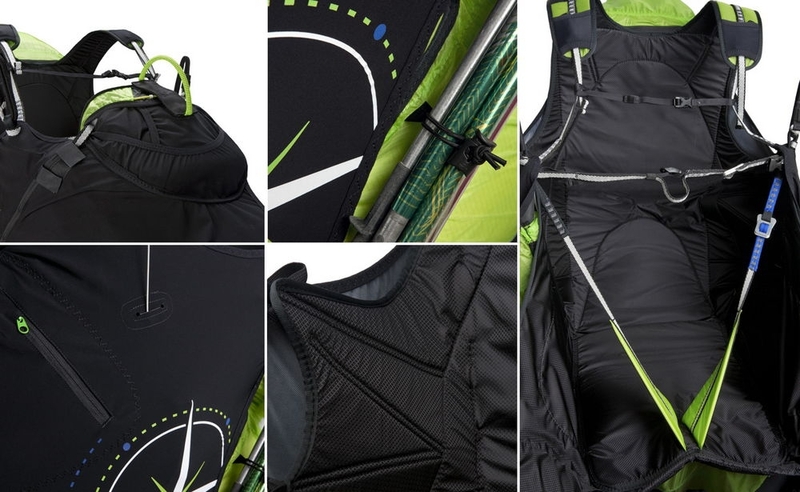 The look of the harness remains unchanged but the riser zipper changes to green and new Supair logos. The speed system pulleys are assembled without the possibility of making a mistake. The cord still runs through the pulley. Be aware, degradation remains possible during reserve parachute extraction on this ultralight harness. ** If you prefer different harness-to-wing connectors (karabiners, maillons or softlinks) then let us know when you place your order with us. Does comfort and the piloting qualities change? Does the previous back protector design fit in the new harness version? No, the STRIKE 2018 (Index A5) accepts the new BUMP 16 STK only. Does the new BUMP 16 STK protection fit in the previous STRIKE designs (Index A1 to A4)? What are the differences between the previous version certified LTF with the BUBBLE BUMP and this version also certified LTF with the BUMP 16 STK? 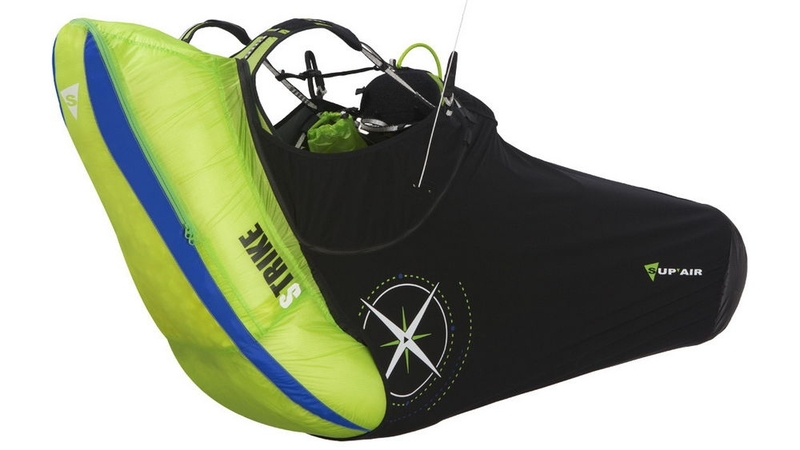 Download advice on getting in to, and being comfortable in, your harness speedbag here (PDF).